For a minute there, it looked like 2005 was going to be JetBlue’s year. New Yorkers’ favorite airline had crossed $1 billion in revenue in 2004, launching it into the category of “major” airlines. The company was prepping to add a new, smaller class of planes to its fleet, which would allow it to take its fare-busting strategy to even more underserved markets. The deal to take over the legendary Eero Saarinen–designed Terminal Five at JFK was on track. And the company had put together a string of sixteen consecutive profitable quarters since going public—a streak that had no end in sight when the year began. 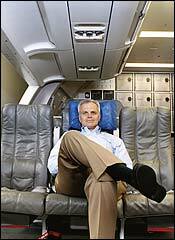 On September 20, JetBlue CEO David Neeleman told a Toronto news conference that the effects of Hurricane Rita—specifically, the surge in jet-fuel prices that came in its aftermath—would “put the final nail” in the company’s third-quarter results. His insinuation: In spite of a series of fare increases this year, the airline would likely post a quarterly loss for the first time since becoming a public company. The next day, though, mere numbers were rendered irrelevant, at least for a few hours. The entire country watched as JetBlue Flight 292 from Burbank to New York circled the Southern Californian skies with its nose gear stuck sideways. As the pilot prepared for an emergency landing, passengers were able to watch much of the coverage from the seat-back TVs that are among JetBlue’s signature amenities. Neeleman says he was calm as he received the news about Flight 292 on his drive home to New Canaan, Connecticut, and then quickly returned to the JetBlue office in Queens. “I spent the night in our command center,” he says. “We had a pretty good handle on what was going to happen. I was confident.” His biggest worry wasn’t that the plane would flip over on landing, as some speculated might happen. He was more focused on what would take place after the plane came to a stop and had to be evacuated on the runway. “I was concerned that people might panic and go out the emergency doors,” he says. But they didn’t, and disaster was averted. But combined with the likelihood of a third-quarter loss, the episode raised an ugly specter—that JetBlue, for all its lovable personality and novel branding, is not immune from the ills that afflict the industry as a whole. Although it’s in a much better financial situation than most of its peers—Delta and Northwest both filed for bankruptcy in September—rising fuel prices had rating agencies threatening to downgrade JetBlue’s debt in late September. And in the first half of 2005, after years of superior performance, JetBlue posted the fourth-worst on-time rating among nineteen domestic airlines. JetBlue blamed it on problems at a single airport—Fort Lauderdale—but that sounded like the excuses other airlines are always making. All of this marks the first time in its short life that JetBlue has really had to grapple with anything but good news. Neeleman is now confronted with the biggest challenge of his career: making sure his cute little adolescent doesn’t grow up to be just like all the other grown-up airlines. In the four years up through 2004, while the ten largest U.S. carriers lost a total of $28.5 billion, JetBlue made almost $250 million in profit. It did so by keeping its costs down—through hypervigilant management of its workforce and equipment—and by offering a product that cleverly distinguished itself from that of its competitors. Part of this had to do with attractive features like those seat-back TVs as well as a spiffy image reinforced by friendly, nattily attired employees. But the greatest single reason for JetBlue’s success was its fares, which, though not always the very lowest, conformed to a predictable pattern that customers could rely on. And this is where fuel prices have wreaked havoc. In repeatedly raising its prices this year, JetBlue has been forced to join the herd that it has always prided itself on standing apart from. The basic discipline of its pricing strategy, however, remains intact. For any particular route, JetBlue uses just four primary inputs to determine its fares—the length of a flight; the number of seats on the aircraft; the estimated cost per available seat per mile, or ASM; and the anticipated “load factor,” or percentage of seats sold on the plane. To show me how it works, JetBlue’s vice-president of route planning, Dave Ulmer, walked me through a route that the airline is considering adding. Using a flight length of 1,391 miles, Ulmer entered in the 156 seats on the airline’s A320 aircraft. That gave him 216,996 ASMs for the flight. Multiply that by JetBlue’s projected cost per ASM of 7.13 cents (the second-quarter ASM was 6.62, but Ulmer added 51 cents to adjust for fuel-price increases), and you get a cost of $15,472 per flight. He then made a conservative estimate of a load factor of 82.05 percent—JetBlue’s first-half load factor was 86.8 percent—and got an average of 128 passengers per flight. Divide the $15,472 cost by 128 passengers, add JetBlue’s target operating margin of 10 percent and a 7.5 percent excise tax, and the average fare comes out to $143 each way. That’s a mere $10 or so over the airline’s JFK-to-Florida fare structure. To achieve that average fare, JetBlue then made a few assumptions about how people will buy tickets for the flights. In this case, the airline assumed that 75 percent would be split equally between fare sales, fourteen-day advance ticketing, and seven-day advance. The remainder would be split 15 percent for three-day advance purchases and 10 percent walk-up. The proposed price structure rewards people who buy early without overly taxing the last-minute buyers as much as most airlines do: Fares range from an $84 sale price to a maximum of $269 for walk-up purchases. Ulmer wouldn’t reveal which city we were talking about, but a quick scan of the map suggested the route was JFK-Dallas, a flight for which American is currently charging walk-up coach prices of up to $799. Even fourteen-day advance buyers on American could pay up to $599, more than JetBlue would hit you up for if you walked into the airport and tried to buy a ticket an hour before the flight. For the new Embraer jets, which JetBlue plans to use for shorter hauls, like New York to the Carolinas, the airline is flying a little blind when doing a similar calculation, as it doesn’t know yet what the cost per ASM will be. But the exercise is the same: Using a proposed flight length of 541 miles (Ulmer says the airline is planning on 650-mile flights as the average for these planes), a cost per ASM of 12.5 cents—nearly double the current cost per ASM on the larger planes—and 85 percent loads on the 100-seat planes, Ulmer comes up with a $94 average fare. The highest fare is a $149 walk-up price—on a route for which a major competitor was charging $119 on a fourteen-day advance purchase on October 3, with an overnight stay required, and walk-up fares of $534. Well, the total increases in 2005 amounted to a little more than that, but Barger’s right in this respect: Customers aren’t fleeing the airline. Through the end of September, JetBlue’s planes were 86.7 percent full, up more than 3 percentage points from last year. Two years ago, Delta started Song, mimicking many of JetBlue’s ideas, including seat-back TVs, as well as adding a few twists of its own: Passengers can order custom cocktails created by nightlife impresario Rande Gerber, limber up with an in-flight exercise program devised by David Barton, and admire Kate Spade–designed uniforms on the crew members. Frequent fliers can use their points on either airline, meaning a regular New York–to–Florida traveler on Song might cash in for a trip on Delta to Europe, a benefit unavailable to JetBlue passengers. There is evidence that Song is making headway: In May, Reader’s Digest awarded the airline “Best In-Flight Service.” “Our mission is to create brand evangelists, to make travel fun again,” says Joanne Smith, president of Song. That sounds a lot like JetBlue, although despite repeated attempts on this reporter’s part, Smith could not be coaxed into even uttering her rival’s name, let alone acknowledging what Song has borrowed from the airline. Like JetBlue, Song intended to reconfigure the economics of air travel—crews were to be smaller and expected to work harder and faster. But according to JetBlue, the formula isn’t working for Song. Though Delta won’t release separate figures for Song, JetBlue used data from Delta’s filings with the Department of Transportation to construct its own profit-and-loss estimates for its rival. And according to that research, it actually costs Delta more to fly Song on a per-seat basis than it does to fly Delta itself. Still, JetBlue is not above learning a thing or two from its competition. To counter Song’s vast audio offerings (passengers can customize their own playlists from 1,600 MP3s), JetBlue is rolling out XM Satellite Radio on its planes. But Neeleman has no interest in copying some of Song’s more extreme gimmicks, like the limited-edition, $238 “Mile High” jeans, complete with Song’s logo on the back pocket, that the airline produced to celebrate its nonstop New York–to–Los Angeles service in the spring. To Neeleman’s way of thinking, JetBlue’s competitors are simply focusing on the wrong thing. “If you were a rational person running a big airline, you would stop trying to put people like us out of business, and instead build stone walls around your fortresses and defend those,” he says. By fortresses, he means two things—hubs and international flights, neither of which is really under attack from JetBlue. JetBlue’s CEO says he doesn’t really mind if fuel prices keep going up—because he knows his beleaguered rivals won’t be able to handle it. Neeleman adds that when JetBlue has found itself in wars of attrition, it doesn’t needlessly stick to its guns. A case in point is the Atlanta–Long Beach route, which JetBlue abandoned in 2003 after just six months, when Delta and low-cost competitor AirTran dug in their heels. According to JetBlue, the trouble started when it offered a $99 fare sale, which was quickly matched by the other two. Overnight, a route that used to have eleven or so flights a day, with fares up to $2,000, was swamped with 26 flights a day on which it became nearly impossible to get anything more than $99. In such an environment, the airline chose to retreat from Atlanta entirely. In the current environment, Southwest has continued to outmaneuver everyone in the business. When crude-oil prices plowed past $60 a barrel, crushing every airline in its path, Southwest was paying $26 a barrel for 85 percent of its fuel, because of its prescient hedging strategy. And as long as oil prices remain high, this competitive advantage will extend into the next few years. Sixty-five percent of Southwest’s oil in 2006 will come at a cost of $32 a barrel. By 2008, it’ll still be getting 30 percent of its fuel at $33 a barrel. JetBlue did a fair amount of its own hedging, which is one of the reasons it was able to stay in the black for as long as it did. Through the first half of the year, it was paying less than $1.50 per gallon for fuel, while the market rate had exceeded $2.50. But most of those hedges have now expired, and JetBlue has only 20 percent of its fuel costs hedged for the remainder of the year at just under $30 per barrel. If fuel prices don’t fall significantly, JetBlue’s margins will come under increasing pressure and the airline may be forced to make yet another price hike. The company has no hedges in place for 2006 and beyond. When I ask Neeleman about sky-high fuel prices, I expect him to brush off the question, to refer me back to JetBlue’s oft-noted competitive advantages. But he does better than that. He says he really can’t make up his mind about whether he wants fuel prices to come down or go up. If they come down, of course, JetBlue returns to profitability. If you take fuel costs out of the equation, the company has become an even more efficient operator than it’s been in the past, and business is good; revenues in the second quarter jumped 34.5 percent to $430.1 million, up from $319.7 million in the same period in 2004. Any savings on fuel prices go straight to the bottom line. But consider the flip side: If fuel prices go up, JetBlue’s efficient business model means it loses less than pretty much everyone else, save Southwest. Most of its competitors couldn’t cadge a loan no matter what terms they’d be willing to accept, but in March, JetBlue was able to borrow $250 million. That left it with $562 million in cash and short-term investments at the end of the second quarter, enough of a cushion to weather increased costs for some time. Then, in mid-July, the airline announced that it had purchased “caps” as a sort of catastrophic insurance if prices continued to rise. Problem is, it was too late for bargains: The best JetBlue could do was ensure that it wouldn’t pay more than the equivalent of $65 a barrel of oil for 20 percent of its fuel needs in August, and $66 a barrel for just 15 percent in September. It may be saving the airline a few bucks here and there, but the days of hedging for $30—or even $50—a barrel are long gone. So why does JetBlue have only 20 percent of its fuel costs hedged for the remainder of the year—and none beyond that? As recently as last year, it would have been quite easy to buy hedges for oil at $35 a barrel, half today’s prices. Michael Linenberg, the airline analyst at Merrill Lynch, wrote in late June that if oil prices stay above $55 a barrel for the foreseeable future, there would undoubtedly be capacity cutbacks, further bankruptcies, and possibly even liquidation. And he speculated that “financially formidable low-cost carriers” like Southwest and JetBlue would be the most likely candidates to be picking up the pieces of others’ failures. Last spring, Neeleman told me that if oil prices stayed above $50 a barrel, two of the six majors would go out of business. One’s already gone: US Airways and low-cost carrier America West announced the completion of their merger in September. The smaller airline held most of the cards in that merger, which represents the first example of a low-cost carrier literally buying its way into the big leagues. But JetBlue executives reject the possibility of a similar move on their part. They’re not nearly finished executing their own plan, they say, and have no interest in absorbing another company’s problems. Or, at the very least, while stomaching not-too-unreasonable losses. Unless oil prices plummet—a highly unlikely scenario—it appears that JetBlue is going to have to settle for losing a little less than the competition for now. But it is better off than almost everybody. According to Goldman Sachs analyst Glenn Engel, JetBlue will have break-even cash flow in 2006 if oil prices find their way back to $53 a barrel. Delta and Continental need $43, and Northwest an even more improbable $34. For now, Neeleman seems perfectly content to sit back and watch his rivals continue to suffer. “We can tolerate this level of prices for a long time,” he says, without sounding like he’s lying through his teeth. “We may not be profitable as we tolerate them, but we can tolerate them—a lot longer than our competitors can. Companies built for the good times go out of business in the bad times. This company was built for the bad times.” Perhaps 2005 will turn out to be JetBlue’s year after all.